• In a prime location just a stone's throw to the best shopping areas and main attractions of the city. • Escape the hustle and bustle of the city at one of the best spas in London. With so much to see and do in the capital, London is a treasure trove of history and multiculturalism. London is an awe-inspiring city brimming with galleries and museums, some of which are famous throughout the world. From the natural wonders housed inside the ornate, terracotta façade of the Natural History Museum to the cutting-edge artists pushing boundaries inside the Tate Modern, a staggering number of London’s cultural attractions provide free entry for visitors. Visit the famous shopping districts of Knightsbridge, Oxford Street and Bond Street, all with easy access from the Hotel via public transport. If you fancy a show, visit London's West End for a fun-filled evening. If you are looking for tranquility away from the hustle and bustle of 'the big smoke', head to beautiful Hyde Park or Regents Park. There really is so much to see and do, whether you want to visit the main tourist attractions such as Buckingham Palace, The Houses of Parliament or the London Eye, or looking for something a bit different, you are sure to be spoiled for choice! Made up of 11 Georgian townhouses, Brown’s has a rich and intriguing history. Distinguished guests have included presidents and prime ministers, royalty and writers. One notable regular was Agatha Christie — her 1965 thriller, At Bertram’s Hotel, was inspired by Brown’s. Brown’s was London’s first ever hotel. It opened its doors in 1837 under the watchful eye of Lady Byron’s maid, Sarah — and her husband, James Brown. Alexander Graham Bell visited London in 1876 to tell the Government about his latest invention. He chose to stay at Brown’s during his trip — and made the first ever telephone call from the hotel. 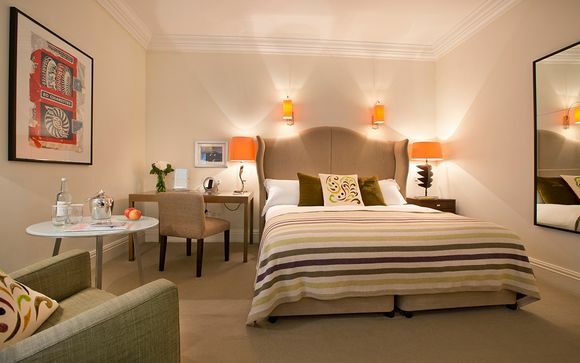 One of the finest 5-star hotels in London, Brown's Hotel is located in London's exclusive Mayfair. The Hotel is as close to the boutiques of Bond Street as the Royal Academy of Arts. As near to the hustle and bustle of Soho as the calm of Green Park. Brown's hotel is a place where you can take traditional Afternoon Tea and taste the best of modern British cooking, courtesy of the capital’s celebrated chef, Mark Hix. Like all good hosts, the hotel are committed to helping guests experience the city as Londoners do. This offer is based on a Classic King Room, which can accommodate up to 2 adults. Our members will receive a complimentary room upgrade (subject to availability on arrival). A distinctive mix of old and new, each of the 117 bedrooms has been designed by Olga Polizzi. Her exquisite blend of styles and vintage gives a distinctive charm to the finest rooms in London. Decorated with British artworks and fabrics, the Classic rooms are both luxurious and comfortable. Complete with an armchair, coffee table and desk, enjoy a great night’s sleep in either a king size bed or one of two single beds. The large bathrooms have timber and mosaic detailing. Our members will receive a continental breakfast each morning. Sophistication and style is always on the menu at Brown’s, whether it’s in the HIX Mayfair restaurant, Donovan Bar or award-winning English Tea Room. One of the best restaurants in London, the HIX Mayfair menu is all about big British flavours handled deftly and with sophistication. Each plate as much of a work of art as the Tracey Emin and Bridget Riley that hang on the walls. Named in honour of British photographer Terence Donovan, the bar’s walls are lined with over 50 of his black and white prints. The extensive range of wines, champagnes and cocktails are all served with a twist of style. Order a signature Donovan Martini and take a seat in the ‘naughty corner’ with Donovan’s more risqué pictures. Alternatively, sit beside the original 19th century stained glass window of St George in one of the coolest bars in London. For a slice of traditional London life, enjoy the fabled Brown’s Afternoon Tea in the award-winning English Tea Room. Take your pick from over 17 teas — including Brown’s own blend — and a selection of sandwiches, scones, cakes and pastries. The surroundings are a perfect blend of old and new. Original wood panelling and antique fireplaces sit comfortably with Paul Smith floor lamps and contemporary artwork. The Spa at Brown’s is the perfect place to escape the city’s hustle and bustle or prepare for that big event. In keeping with their reputation as one of the best spas in London, guests can expect only the finest products. If you fancy a work out, visit the Brown's gym, which is open round the clock and provides a range of cardiovascular, weight and resistance equipment.